In this activity, students will find the volume of prisms and pyramids. 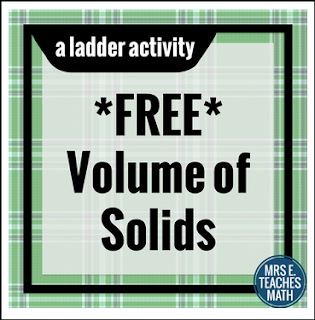 This ladder activity is a great alternative to a worksheet. Students will cut the problems apart along the lines and work the card labeled "Start" and find their answer on the top of another card. They tape their cards together until a chain is formed. There are 11 problems. All of the problems are volume problems. Some of the problems are word problems and some have diagrams. Students will find the volume of prisms, cylinders, pyramids, and cones. Knowledge of special right triangles or pythagorean theorem is not necessary. The problems are straightforward and could be used for middle school or as an easier activity in high school. This activity can be completed individually or in pairs. An answer key and instructions are provided.